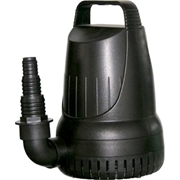 Alpine Hurricane Pond Pumps are ideal for heavy duty waterfall or pond filter systems. Hurricane Pond Pumps have the needed power pump water through long pipe runs, restrictive UV Clarifiers and pressure filters. Designed for continuous duty in even the harshest pond environment. 3 Year warranty.